The AL program is designed to bring together emerging leaders from across our community for in-depth examination of key community components, intensive leadership training and a chance to work with over 100 local change agents. You will learn how to successfully utilize your own leadership style, explore your city and region at a whole new level and work with the most successful leaders in our area. No matter who you are, we are confident your AL experience will challenge you, enlighten you and inspire you to act on your passions! Applications are available every spring on our website and on social media. After we receive the application, an interview will be scheduled and a leadership assessment will take place during interview time. All candidates will be contacted about whether they have been accepted into the program and will be provided with next steps. Accepted candidates are invited to the current cohort graduation/celebration event. Arrangements for tuition payment must be finalized prior to the beginning of the program. Many employers will cover all or part of tuition; several partial scholarships are available annually for individuals with a demonstrated need. Let us know before your interview if you would like to apply for a scholarship. Opening Retreat is held in mid-September. Program days typically start at 8 am and end at 3 pm. Schedule details will be available by June. Program days are held every third Thursday of the month. (Subject to change due to holidays and host facility scheduling.) Several afternoon project planning sessions are also required. Program calendar starts in September and ends in June. Every cohort is responsible to complete a community project. There are four project work days scheduled to help facilitate logistics. However, each cohort is expected to meet and work outside of scheduled time. Deadline for project completion is the end of May. Graduation/celebration event takes place in June. 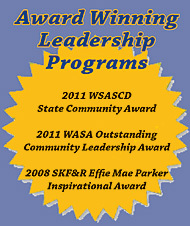 During the program year, leadership material is expected to be read. After two unexcused absences, (an unexcused absence is any absence without written notification 24 hours prior to program day), you will be invited out of the current year’s program and asked to re-apply. Site visits are often included in your program day so expect to be moving. We aim to consider food allergy concerns when purchasing lunch, however, it serves everyone to ask us prior to program day so necessary adjustments can be made. ALA leaders represent the multitude of industries, organizations, communities and cultures in our region. We ask that everyone be respectful of the diverse viewpoints presented and handle crucial conversations with honesty, openness and grace. Applications for our 2020 Advancing Leadership Adult class will be available April 15th, 2019.